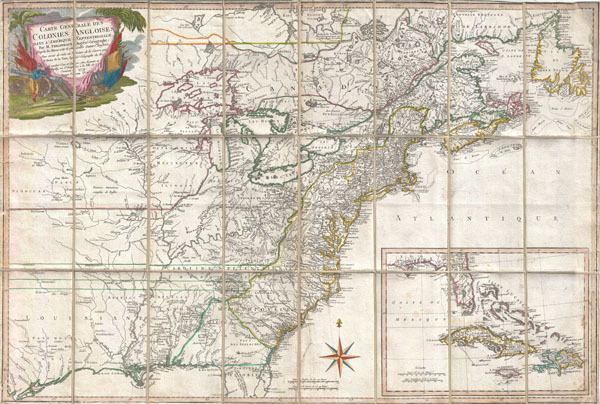 Revolutionary War map of the United States drawn to capitalize on French interest in the war. Carte Generale Des Colonies Angloises Dans L'Amerique Septentrionale. This is an important and extremely rare 1779 case map of the English colonies in in North America at the height of the American Revolutionary War. Focusing on the English Colonies, this map covers the eastern part of North America from the Hudson Bay to the Gulf of Mexico, extending westward as far as modern day Galveston. Rene Phelippeaux and Brion de la Tour issued this map following the 1778 signing of the Treaty of Alliance between France and the fledgling United States, which brought the American Revolutionary effort to the attention of the French public. Cartographically this map is based upon the important John Mitchell map of 1755. As a whole it presents the colonies in superb detail, identifying cities and towns, forts, roads, Indian villages and tribal territory, and coastal shoals and banks. Curiously this map attempts to offer both a French and an English mapping of the region. Phelippeaux presents French Louisiana extending eastwards as far as the Appellation Mountains and westward well into territories claimed by Spain, however, it also shows the original Carolina grant from the British crown extending westward to the edge of the map. The fact that Louisiana west of the Mississippi had been ceded to Spain following the French and Indian War does not seem to be acknowledged. What is acknowledged is the cession of Upper Louisiana, north of 40 degrees latitude and east of the Mississippi, to the British under the 1763 Treaty of Paris. This important treaty effectively gave the British control of the lucrative fur trade in the upper Mississippi Valley and eventually gave rise to the North West Company and the era of the Mountain Men in the early years of the 19th century. This map is also of particular significance for those interested in the history of the Great Lakes. In Lake Superior the ghost islands of Phelipeaux (no relation to our author) and Pontchartrain are noted. These apocryphal islands first appeared in a 1744 map by Nicholas Bellin and were later picked up by Mitchell for inclusion in his monumental map of the British Colonies in America. Following the Revolutionary War the 1783 Treaty of Paris used the islands to form the official border between the United States and Canada as a transient 'by Lake Superior north of the islands and royal Phelipeaux to Long Lake.' It was not until the official U.S. – Canada border surveys of 1820 that the existence of these islands was finally brought into question. Texas is defined as the Pays de Cenis, referring to the Cenis tribe which, from the 16th through the 18th centuries, was one of the largest and most powerful tribes in the American southwest. Known for their hospitality towards European travelers, the Cenis are remembered for amicably hosting La Salle, Onate, Coronado, and other early explorers. In fact, in the Cenis language the word for welcome is 'Techas, Techas,' meaning 'friend.' Eventually 'Techas' become known as 'Tejas' and, in time, 'Texas.' With the French and subsequent American settlement of Louisiana, as well as the exodus of the Natchez and Chocktaw from Alabama, the Cenis were confined to a smaller and smaller territory surrounding the Trinity (Trinidad) River – as their villages are shown here. Eventually the remaing Cenis and a large group of emigrating tribes met in a great battle on the Bank of the Trinity in which the Cenis nation was utterly destroyed. It is also noteworthy that this map is published in an unusual dissected folding format, commonly called case format. While common in the 19th century, dissected case format maps are rare in 18th century due to this format rendering the map less durable than traditional book-format binding. All and all, this map is wonderful discovery and an important addition to any Revolutionary War themed map collection. Published by Esnauts et Rapilly, rue st. Jacques, a la Ville de Coutances, Paris, 1779. Exceedingly rare in all editions. Rene Phelippeaux (1748 - 1784) (also, Rene Phelipeau) was a French cartographer, geographer, and surveyor active in Paris in the latter half of the 19th century. Phelippeaux most likely began his mapmaking career as a public surveyor. His earliest known map is a 1791 survey of the burrow to Croissy-Sur-Seine commissioned by Jean Chanorier in 1781. Later Phelippeaux worked as a professor of mathematics at the Royal Military Academy of London. He seemed to have a special interest in the mapping of the fledgling United States and the West Indies. In addition to several important case maps published in conjunction with J. B. Nolin and Brion de la Tour, Phelippeaux also produced important map collections focusing on the colonies of Santo Domingo and Martinique. Louis Brion de la Tour (1743 - 1803) was the Cartographer Royal to the King of France, his official title being Ingenieur-Geographe du Roi, Despite a prolific cartographic career and several important atlases to his name, little is actually known of his life and career. He mat have been born in Bordeaux. His son of the same name was born in 1763 and published until his death in 1832. It is nearly impossible to distinguish the work of the father, from the work of the son, as both used the same imprint and were active in roughly the same period. Much of their work was published in partnership Louis Charles Desnos (fl. 1750 - 1790). Their most notable work is generally regarded to be his 1766 Atlas General. Esnauts and Rapilly (fl. c. 1775 - 1811) were Paris based print sellers and publishers active in the later part of the 18th century. The firm was founded by Jacques Esnauts and Michel Rapilly. Esnauts and Rapilly are best known not for their cartographic works, but rather for their fashion prints. The important publication La Galerie des Modes highlighted the fashions of the French aristocracy just prior to the French Revolution and is considered to be the first published "fashion magazine". At this time, Paris was the center of the fashion world and Esnauts and Rapilly's plates were widely distributed to eager fashionistas the world over. The firm also published a number of important and influential maps including several depicting pivotal moments in the American Revolutionary War. Not wanting to miss out on potential customers, Esnauts and Rapilly gave exact directions to their bookshop on many of their publications: "at the Baker's shop, opposite the Cutler." Very good. Minor restoration to upper right corner. McCorkle, B. B., New England in Early Printed Maps 1513 to 1800, #777.18. Sellers, J. R., and Van Ee, P. M., Maps and Charts of North America and the West Indies 1750-1789, #150-5.